The 2017 America's Cup will be the 35th edition of the most prestigious yacht race and one of the oldest trophy in international sports. The Cup will be contested between the Oracle Team USA and the winner of the America’s Cup World Series due to start next June. 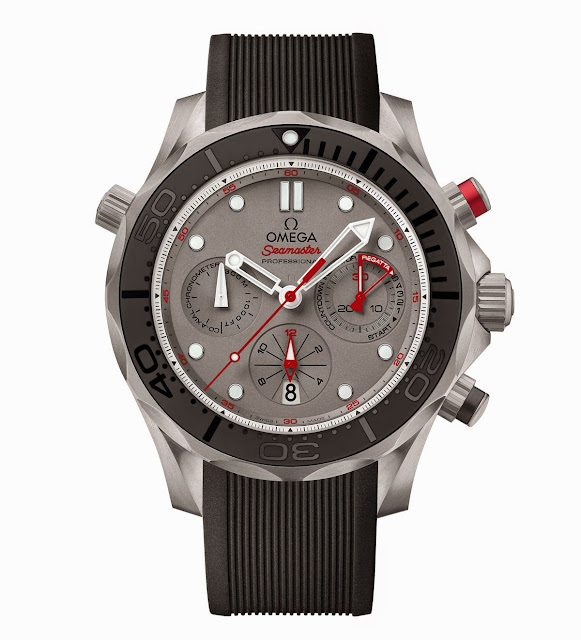 As a long time supporter and sponsor of one of the competing teams, the Emirates Team New Zealand, Omega just presented a new Seamaster commemorative timepiece. The Seamaster Diver 300M ETNZ features a black ceramic unidirectional rotating bezel with a polished diving scale whose indications have been created in relief using laser ablation. 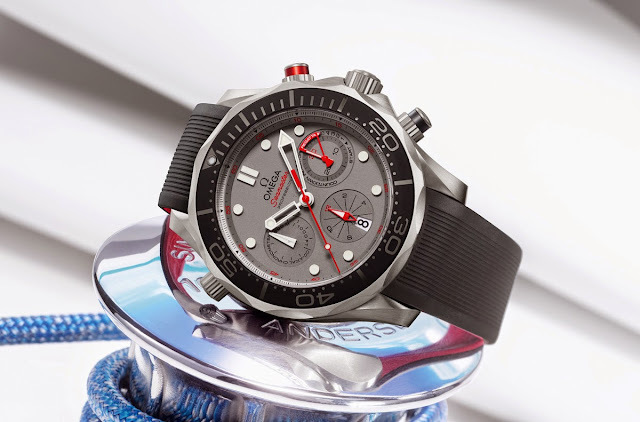 The sand-blasted titanium dial has applied indexes coated with white Super-LumiNova emitting a blue light while the dot at the top of the bezel at 12 o’clock, also coated with white Super-LumiNova, emits a green light. 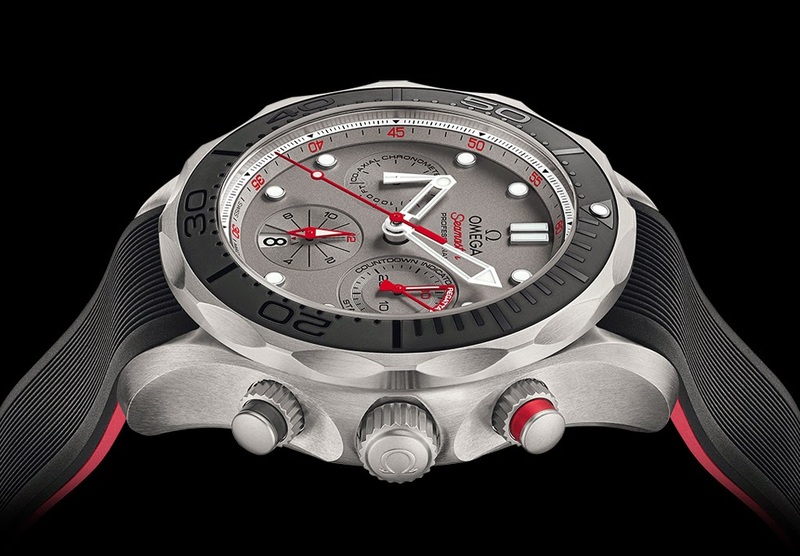 The elements that correspond to a chronograph function, including the chronograph seconds central hand, are easily recognisable for their red colour. The 30-minute and 12-hour counters are positioned at 3 o’clock and 6 o'clock respectively. 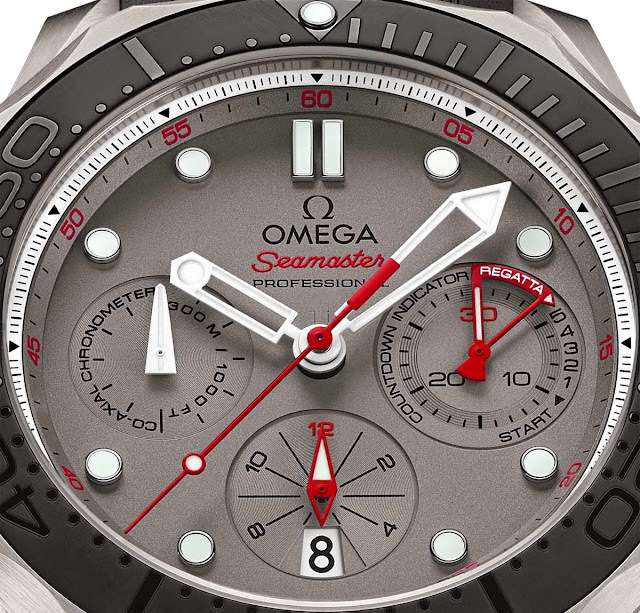 The 30-minute counter also indicates the five-minute countdown to the start of a regatta. 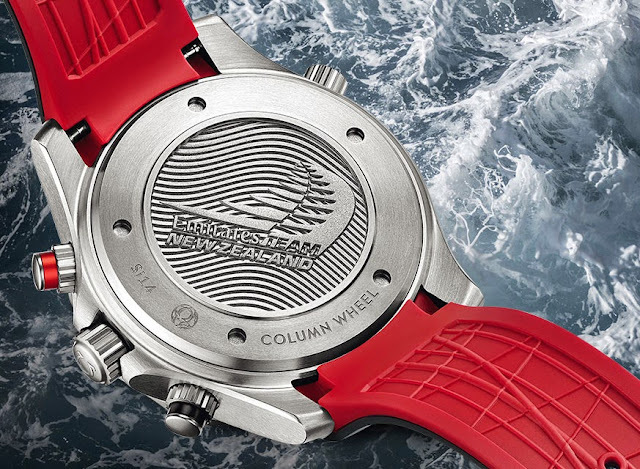 The inscriptions inside the small seconds sub-dial at 9 o’clock remind the wearer quality of the movement - a certified chronometer with co-axial escapement - and that the timepiece is water resistant to 300 metres / 1,000 feet. The 44 mm brushed case is also crafted from grade 5 titanium. The two chronograph push pieces at 2 o’clock and 4 o’clock stand out with a red aluminium ring and matt black ceramic ring respectively. On the other side of the case, at 10 o'clock, we find a helium escape valve with an integrated date corrector. 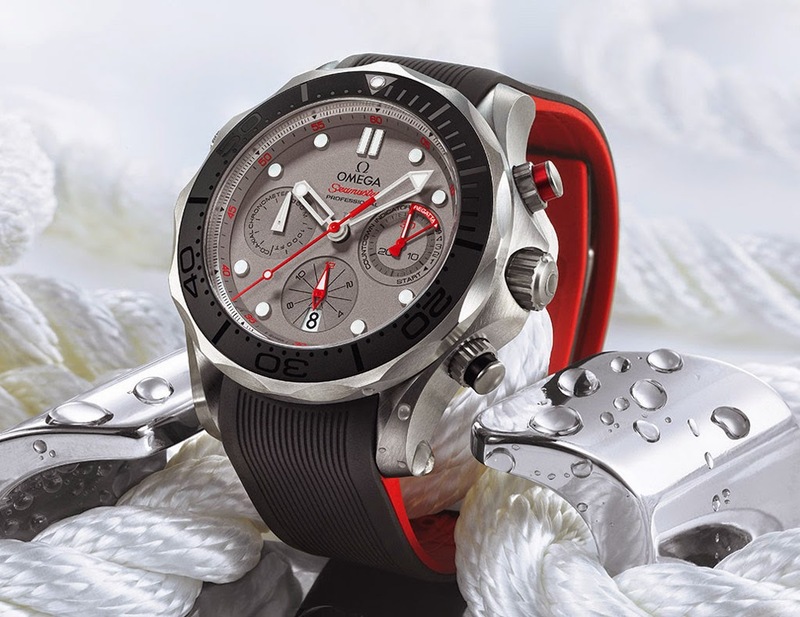 The Seamaster Diver 300M ETNZ is matched to a two-sided rubber strap with a foldover clasp. The top part of the strap is black, while the internal part is red with a special pattern designed to ensure that water and air can freely pass underneath allowing the skin to breath. Protected by the caseback decorated with the embossed ETNZ logo, the Co-Axial calibre 3330 movement, equipped with an antimagnetic and highly resilient Si14 silicon balance spring, beats at 28,800 vibrations per hour and guarantees a power reserve of 52 hours. 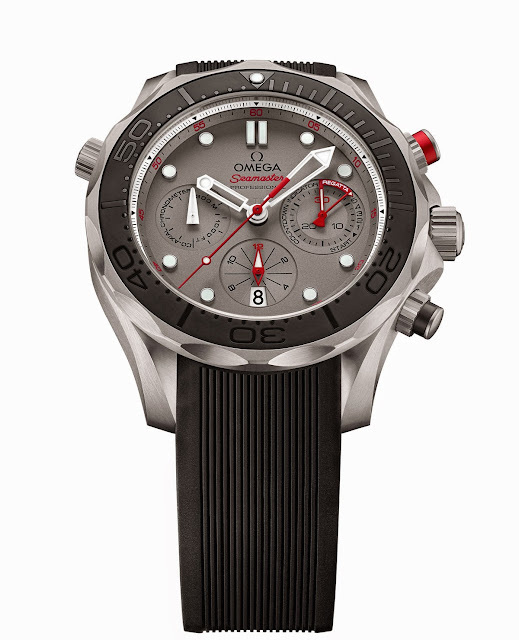 Omega Seamaster Diver 300M ETNZ. The 2017 America's Cup will be the 35th edition of the most prestigious yacht race. The Cup will be contested between the Oracle Team USA and the winner of the America’s Cup World Series due to start next June. As a long time supporter and sponsor of one of the competing teams, the Emirates Team New Zealand, Omega just presented a new Seamaster commemorative timepiece: the Seamaster Diver 300M ETNZ. The Omega Seamaster Diver 300M ETNZ will be available in the coming weeks with a retail price of Swiss Francs 6,500.